Prepare your organization for the latest PCI 3.1 compliance requirements. Whether you’re planning a late-year PCI 3.0 audit or interested in what’s changed with PCI 3.1, Armor is here to ensure that your next audit runs smoothly and that your customer’s data is protected. The best place to start your PCI compliance journey is by examining your cardholder data environment (CDE). You’ll want to check to ensure that all relevant elements are defined as being part of your CDE as it is currently. The new PCI 3.1 requirements branch our key areas like pen tests, risk assessments, inventories and more to ensure all information is secure. Having conducted countless webinars, written articles and spoken at conferences, we understand how enormous of a task it is to maintain PCI compliance. Helping your organization secure their PCI compliance is Armor CISO Kurt Hagerman, a certified PCI compliance (CISA, CISSP) expert, to offer guidance on what will help your organization to a smooth and seamless PCI 3.0 audit. 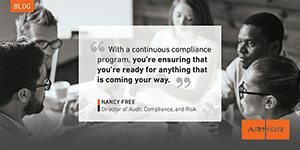 Prepare your organization for success on your next PCI audit by downloading our CISO Vantage Point on “Your PCI 3.1 Compliance Validation”. You can also search through our Knowledge Center for more infographics and resources to learn more about securing your data.